Home » Blog » Everest Base camp Cho-la pass trek. Everest Base camp Cho-la pass trek. Information of Everest Base camp Cho-la pass trek. Why Everest Base camp Cho-la pass trek? Offer by Everest Base camp Cho-la pass trek? A rough itinerary of Everest Base camp Cho-la pass trek. Map of Everest Base camp Cho-la pass trek. Permit , Documents and National park fees for Everest Base camp Cho-la pass trek. Equipment and packing list for Everest Base camp Cho-la pass trek. Conclusion of Everest Base camp Cho-la pass trek. Everest base camp Cho-la pass trek is an amazing adventure trip of Nepal.This trek can be done clock wise or anti clock wise, It mean if the trekkers start this Everest base camp with cho-la pass choose clockwise they need to do the Cho-la pass first and then after trekkers will be explore the Everest Base camp. Doing this trek anti clockwise is first explore the Everest base camp, Summit Kalapatthar for the mount Everest view, after that we will pass the Cho-la and come down to Lukla for fly back to Kathmandu. We always recommend this trek to do anti clockwise because some of the time even in peak season, sprig and Autumn if the cho-la pass trail is close due to the snow or own reason of trekkers not be able to pass the Cho-la,in this case at least trekkers can Explore the Everest Base camp and Summit Kalapatthar which is the best view point of Mount Everest. Everest Base camp Cho-la pass trek offers Uncountable stunning scenery every camp as well as during the trails. The main attraction of this trail is Cristal clear blue lake in the lap of Himalaya of Mount Everest, Nogjumba glacier is also another highlight of this trail. Unique Sherpa culture , Namche Bazar , ancient monasteries, such these attraction makes this trail unforgettable those who choose this Everest Base camp with Gokyo Cho-la pass trek. Early morning scenic flight to Lukla (2800m.) from Kathmandu. It takes 30-40 minutes to Lukla. Start our trek and head to Phakding. Descend steeply to the Tharo Koshi which is also known as Kusum Kangru Khola (river). After crossing the Tharo Koshi River through the suspension bridge, you climb to Ghat and continue climb to Phakding. Overnight at Phakding. We follow the Dudh Koshi River and reaches Zamphuti. This is an excellent view point of Thamserku peak. Ascend to Chomoa, the site of an agricultural project, interesting for visiting farming land, We continue our walk uphill and enter the Sagarmatha (Everest) National Park (1148sq km, established in 1976) at Monjo (2840m.). Reach Namche Bazaar with gorgeous views of different Himalayan peak of Everest region . Overnight. (3420m). Rest for the proper acclimatization with some excursion. We can hike around , the ideal place to overview some of the outstanding mountains such as Mt. Everest, Ama Dablam, Thamserku, Lhotse etc. You can walk around the Khumjung valley, Hillary School and Khunde Hospital and then return back to Namche. In Namche Bazaar you can spend some time interacting with the fun-loving Sherpa people. Walk along the ridge and then descend to Dudh Koshi River at Phunkithanka. Then after crossing the bridge we ascend in the steep path up to the Tengboche. On reaching Tengboche you will see the local monastery. Tengboche have largest Monastery of Khumbu region. Overnight. The trail continues along the lateral moraine of the Khumbu Glacier and passes by stone memorials for climbers who have perished on nearby summits. We continue to climb as we are heading to the altitude of 4910 meters at Lobuche which is really just a few huts at the foot of giant Lobuche peak. Overnight. A bit difficult trekking day walk along the Khumbu Glacier and up to Everest Base Camp at 5365 meters, the closest you can get to Mt. Everest . There will likely be a team there about to attempt the summit. The view of the Khumbu Icefall from Base Camp is spectacular. We return back to Gorak shep for the overnight. More or less 8 Hours walking in total. Most of morning we climbing Mt. Kala Pattar, a small peak (by Himalayan standards) at 5555 meters. The ascent is demanding but the climber gets the most magnificent mountain panorama: Everest, the highest point on the planet at 29028ft, 8848 meters, towers directly ahead and on all sides loom the other giants, Nuptse, Pumori, Chagatse, Lhotse and countless others. We make a quick descent to Gorak Shep. Then we descend gently to Lobuche and then go upward to Dzongla. We walk on the flat stone path for some time passing through arid valley. Then we ascend in the steep path to Chola pass in the icy trails along Chola glacier. After we reach Chola pass we descend down on another side through the stony path until we reach Phedi. From there we climb down up to Thangna. It is a small village with few lodges and tea shops. Catch a glimpse of Machhermo peak and many more. Walk along the glacier route until we reach first Lake of Gokyo. The trek is easier over flat path following Dudh Koshi River up to Gokyo. It is a windy valley and situated near the third lake. At Gokyo you are stunned by the natural beauty of Dudh Pokhari Lake. We take rest and explore the Gokyo valley. Gokyo is a trade center where the Sherpa people run lodges to provide the best services to the trekkers. 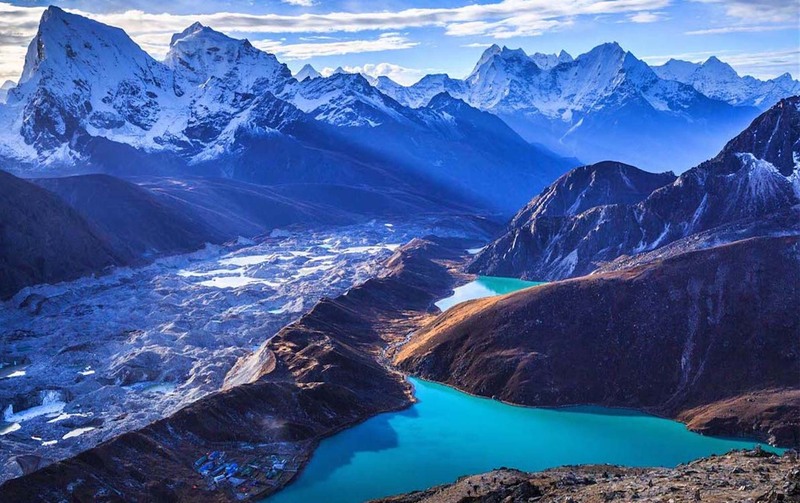 Gokyo is situated by the side of Ngozumba glacier, the biggest glacier of Nepal. We first climb the Gokyo Ri which emerges above the village in the northern side of the Lake. From the Peak you can see the beautiful view of the summits of Everest, Lhotse and Makalu. Then we descend to Gokyo and trek top Machhermo. We follow the Dudh Koshi River. We see large yak pastures there. Walk downhill to Phortse tenga. We pass through the forest covered with rhododendron, pine and local incense. Then we ascend in the steep path to Monglo and then descend gently to Khumjung. From Khumjung we walk in the flat path for some time and then descend to Namche. Descend to Lukla passing through the forest of rhododendron and pine as well as Sherpa villages. Enjoying your last glimpse of the mountains you have recently visited for one last time on the 35-minute Scenic flight back to Kathmandu. Transfer to the hotel in Kathmandu. Everest base camp with Cho-la pass trek. For Everest base camp with Cho-la pass trek, trekkers need Sagarmatha National park fees which is more or less 35 USD per trekkers, Trekker can issue it on the way to Namche Bazar, A new Khumbu village tax 20 USD has been implemented since October 01st , 2017, TIMS Trekkers information management system is not checking properly. Everest Base camp Cho-la pass trek is a bit harder and challenging route than the normal Everest Base camp trek route because Cho-la pass is 5420 Meters, most of the time it covers with snow. It is better we take a normal crampon to pas this Cho-la.